Can Florida Avoid Another Election Day Meltdown? It may seem simple to you, gentle voter. Set up some voting booths, recruit some senior citizens, roll out some "I Voted" stickers, and you have yourself a democracy. But it turns out that running a polling place in the U.S. involves about the same level of complexity as launching a space shuttle. It doesn't have to be this hard, but it is. Polling places are staffed by amateurs and funded and organized by local officials, most of whom are not all that scientific in their planning  and who have limited options to improve their efficiency. "It's like planning a military invasion. It really, really is," says Rokey Suleman, general registrar for Fairfax County, Va., who has recruited 3,100 election workers and more than 500 high school volunteers for Election Day. Suleman has managed to stockpile enough backup paper ballots for 103% of registered voters. He has also contacted the police to ask them to be close by (but not too close by); planned for alternate polling places for every location that can be organized within one hour, in case of a terrorist attack or power outage; and set up a telephone translation service at every polling place, offering voters assistance in more than 100 languages. But even with years of planning, no one knows for sure what will happen at the precincts on Tuesday. One problem is predicting turnout. Election officials can guess at what will happen based on the number of total registered voters before the election and the rate of early or absentee votes. But they have to order machines and print ballots before voter registration and absentee voting end. This year in Virginia, Suleman and other officials are predicting 80% to 85% turnout, which would be unprecedented. Turnout isn't all that matters. A study of the 2004 election in Ohio, in which voting was marred by lines of up to seven hours long in some precincts, found that the length of the ballot was the biggest predictor of delays. If a ballot included dozens of races and a long list of propositions, as it did in some precincts, it took much longer for a voter to complete it. Every hour, about 3% of the voters in those long lines gave up and left, according to Ted Allen, an associate professor of industrial and systems engineering at Ohio State University in Columbus, who co-authored the study. The type of voting machine can also make or break a polling place. 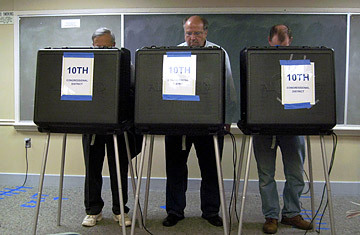 In places with so-called open-face machines (in which all of the options are arrayed in one large display), voting can take each person just a few minutes. In 2004, Ohio voters, using open-face electronic machines, spent two to five minutes voting. But those machines are expensive to buy and transport. This Tuesday, it will take voters 7 to 13 minutes, Allen estimates, because of new voting machines that are not open-face. Voters must scroll down these screens to reach the bottom of the options, and that adds time. Even though election officials can't predict the future, they could make a more scientific guess in many places. To predict how many machines they will need, officials could multiply the estimated number of people registered to vote by the amount of time it takes to complete a given ballot at a given machine and then divide that by the number of hours the voting booths will be open, according to Allen and his colleague Mikhail Bernshteyn of Sagata Ltd., a business-statistics firm that consults with election officials. But most places don't distribute resources this way. "My impression is that almost no one is using any mathematical approach," says Allen. Unlike the people who run hospitals or airports, election officials have not yet fully embraced concepts like queuing theory and modeling. Things have gotten much better in the Ohio counties that were most embarrassed by the 2004 elections, and Allen and Bernshteyn have helped those officials distribute their machines more sensibly. But it typically takes some kind of fiasco for locals to commit the resources that this approach requires. Elections are almost entirely funded at the county level, which means money is scarce. "That is the problem," says Suleman of Fairfax County, Va. "The taxing authority that has the least flexibility and ability has the greatest responsibility." Read "Congressional Races to Watch '08."